The Hospital Consumer Assessment of Healthcare Providers and Systems (HCAHPS) survey was developed by the Center for Medicare & Medicaid Services (CMS) and the Agency for Healthcare Research and Quality (AHRQ) as a standardized tool to allow objective and meaningful comparisons among hospitals on patients' perspectives on their care. Since 2008 CMS has been publicly reporting HCAHPS scores to inform consumers and to create incentives for hospitals to improve quality of care and patient satisfaction. Limited information exists about the methods and effectiveness of concerted efforts by hospitals to improve their HCAHPS scores. 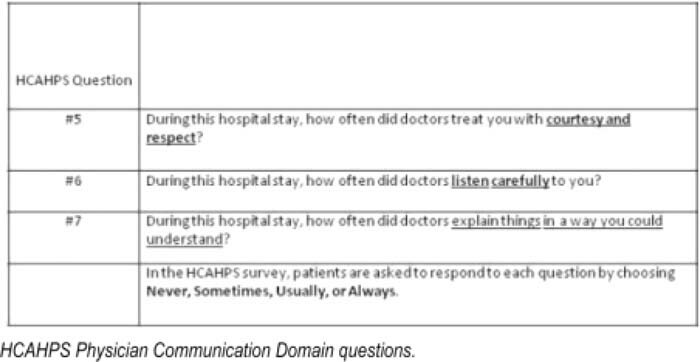 We designed a hospitalist‐led initiative to improve scores in the HCAHPS domain of Physician Communication. In a before–after time series we evaluated the effect of a 3‐month series of educational interventions targeting the physician staff of a 110‐bed community teaching hospital, The interventions consisted of: (1) a 20‐minute presentation explaining HCAHPS, delivered by a member of the Hospital Medicine team to physicians on various hospital committees and clinical departments; (2) a poster summarizing key HCAHPS points and updated hospital HCAHPS scores prominently placed in the physicians' lounge; (3) installation of HCAHPS information slides as a Screensaver on computers used exclusively by physicians; and (4) a physician pocket card listing ways physicians can communicate with patients more effectively, developed by our Section of Hospital Medicine and distributed to hospitalists and community physicians. Hospital administration concurrently conducted a hospitalwide effort aimed at improving scores in HCAHPS domains besides physician communication. 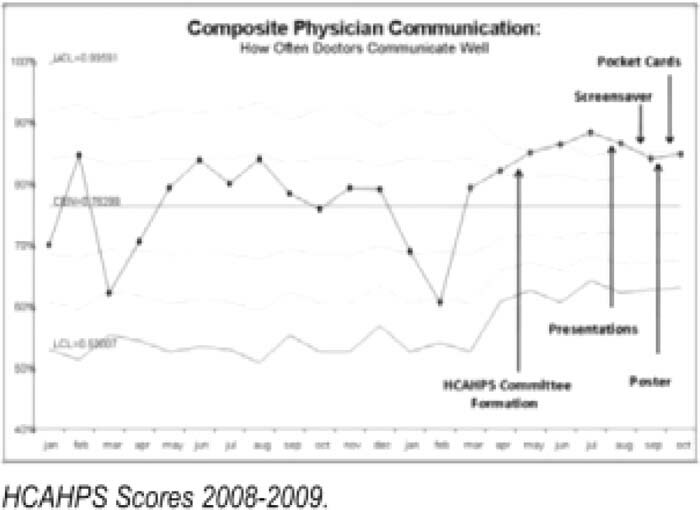 In the 6 months after the initiative started, the statistical process control (SPC) chart of the composite HCAHPS score for physician communication shows 6 consecutive data points on the improved side of the mean line, suggesting but not confirming special cause variation. A multifaceted education initiative led by the hospital medicine service shows a trend toward improved HCAHPS physician communication scores. A concurrent, hospital wide effort led by the hospital administration limits the ability to assign complete or partial causality to this intervention. Additional interventions, such as feedback of underperforming scores to groups of physicians, may produce additional improvement. A. Odetoyinbo, none; C. Ko, McKesson. Consulting; H. Shabbir, none; J. Stein, none; A. Wang, none. Odetoyinbo A, Shabbir H, Ko C, Stein J, Wang A. Improving Physician Communication Scores on the HCAHPS Survey: Early Effect of a Multifaceted Physician‐Led Initiative in a Community Teaching Hospital. Abstract published at Hospital Medicine 2010, April 8-11, Washington, D.C. Abstract 106. Journal of Hospital Medicine. 2010; 5 (suppl 1). https://www.shmabstracts.com/abstract/improving-physician-communication-scores-on-the-hcahps-survey-early-effect-of-a-multifaceted-physicianled-initiative-in-a-community-teaching-hospital/. Accessed April 21, 2019.